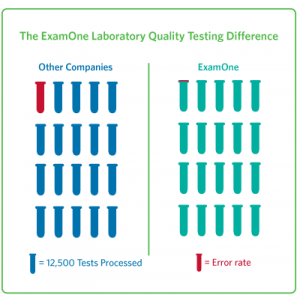 Laboratory Quality Testing: How much are you willing to bet on quality? In school, a 95 percent score is an “A.” But would you be willing to stake a bet of $10,000 or more on an outcome that may be 95 percent correct? What if that bet was $100,000? This is not an easy bet if it were about one’s health and mortality. Healthcare demands a higher level of certainty about its results. People are not partially diabetic or partially suffering from heart failure. There may be risk factors leading one to becoming diabetic, having heart trouble, or other medical conditions and those risk factors should be addressed with preventative care. However, patients need an accurate diagnosis. Insurance companies demand a similar level of accuracy. They are placing bets on their applicants’ health. Insurers will always deal with accidents and other anomalies that actuaries can figure in their results, but they need accuracy in the basic information they gather about their applicants. ExamOne, a business unit of Quest Diagnostics, has embraced Six Sigma quality standards in its approach to conducting laboratory tests for insurance applicants. While some companies brag about a 95 percent confidence level in their exam quality, it still means the typical life insurance application has one mistake. Those mistakes can be detrimental to the applicant, meaning an application was rejected or an individual is paying more than necessary for life insurance. Even the simple question on tobacco use can nearly triple a person’s life insurance rate. [i] Or the mistake can be an overlooked medical condition, leaving an insurance company exposed to claims that can cost thousands or hundreds of thousands of dollars. ExamOne strives for Six Sigma quality. In 2011, our laboratory achieved 99.99 percent accuracy – or less than one error for every 250,000 tests processed. [ii] Having numerous errors causes serious implications for insurers, producers (agents and brokers), and their clients. An inaccurate result can jeopardize the relationship between a producer and a client. A broker, who has a choice of insurers to work with, may opt not to use insurers that have unreliable underwriting. As you can see we place a high premium on the accuracy of medical results. We want insurers and their customers to be sure that ExamOne will meet their needs with the highest quality they can expect. [i] Insurance rate data obtained by Accuquote. A $500,000 10-year term policy for a 45-year-old male with a standard rating. Premiums quoted for a non smoker ranged from $745-$856. A person rated as using more than a pack of cigarettes per day had an annual premium range of $2,202-$2,370.